Hess Corporation is a leading global independent energy company engaged in the exploration and production of crude oil and natural gas. Founded in 1933, Hess Corporation has offices in more than a dozen countries. The company has its headquarters in New York, N.Y. and regional headquarters in Houston, Texas and Kuala Lumpur, Malaysia. Companies acquire and divest businesses for strategic, financial, and other reasons. The process can affect all parts of an organization and cause organization and business disruptions if not managed efficiently. In 2013, Hess decided to streamline its business to focus on energy exploration and production (E&P). As part of the process, the company announced in March 2013 its intention to divest its downstream businesses, including retail, energy marketing, and terminals. In anticipation of separating business systems and data for potential buyers, Hess IT initiated work on Amazon Web Services (AWS) in July 2013 and entered a contractual agreement to have the environment operational and in production by January 2014. “We didn’t have time to re-design applications,” says McDonald. “AWS could support our legacy 32-bit applications on Windows Server 2003, a variety of SQL Server and Oracle databases, and a robust Citrix environment." Hess selected a series of pilot applications in July and began building out the base infrastructure on the AWS platform. After developing quick wins and getting buy-in from leadership, the team spent several weeks gathering detailed information on the remaining application portfolio and providing guidance to Nimbo on security requirements. Working in a cloud environment was an organizational and cultural shift for Hess and it was critical to get the application teams in agreement. “Getting everyone more comfortable with the capabilities of the AWS platform and believing in this approach was extremely important,” says McDonald. Nimbo set up informal sessions to give the application developers — who wouldn’t normally be exposed to AWS — an opportunity to learn about core cloud technologies and functionality. Hess migrated approximately 300 servers to AWS in the US East (Northern Virginia) Region. Amazon Elastic Block Store (Amazon EBS) attached to Amazon Elastic Compute Cloud (Amazon EC2) instances provides block level storage for almost 500 TB of data. Provisioned IOPS volumes for storage in conjunction with instances optimized for EBS provide consistent and low-latency performance for servers with more strenuous IO demands. In extreme cases, provisioned IOPS volumes were configured as a RAID array to increase performance. Hess used multiple versions of Microsoft SQL Server in the environment, including standard and enterprise versions of SQL Server 2000, SQL Server 2005 and SQL Server 2008. To create backups for the SQL Server databases and its Oracle databases, the company used native database backup tools to store data first in Amazon S3 and then into Amazon Glacier for long-term archiving. Amazon CloudWatch monitors cloud resources and the applications. The company’s on-premises infrastructure included NetScaler devices for load balancing and F5 for application firewall management. 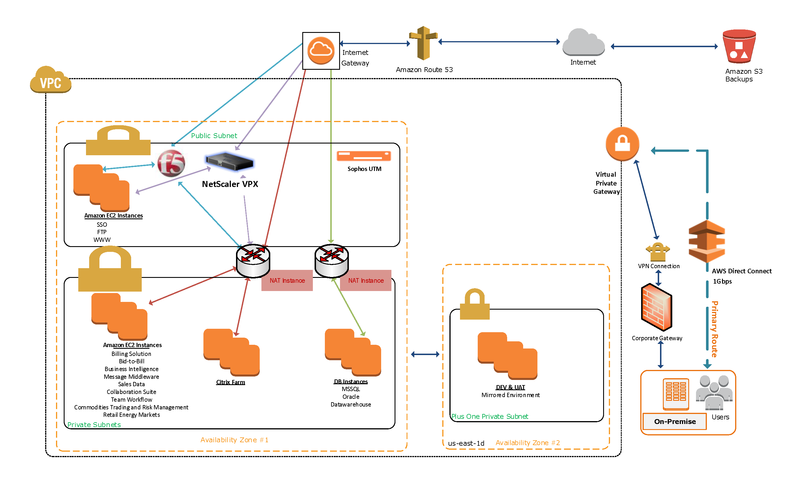 Hess used the AWS Marketplace to virtualize the on-premises devices on the cloud. Figure 1 demonstrates the infrastructure on AWS. Hess wanted to be able to transition the infrastructure to a new owner as seamlessly as possible without a lengthy support agreement. The company started using AWS as its production environment for Energy Marketing in January 2014 and transitioned the environment to the buyer in February. To learn more about how AWS can help you run your business, visit our Enterprise IT details page: http://aws.amazon.com/enterprise-it/. For more information about how Nimbo can help your company run on the AWS Cloud, see Nimbo's listing in the AWS Partner Directory.